LBX Company is proud to announce that the Link-Belt 250X4 hydraulic excavator has won the prestigious 2016 Good Design Award, Japan’s comprehensive design evaluation and commendation system, awarded by the Japan Institute of Design Promotion. The award was presented to Sumitomo (S.H.I.) Construction Machinery Co., Ltd., a world-wide leader in construction equipment innovation and quality manufacturing based in Chiba, Japan. LBX Company is a subsidiary of SCM. This is the fourth Good Design Award that SCM has received since 2008, when the Link-Belt 210X2 was honored. 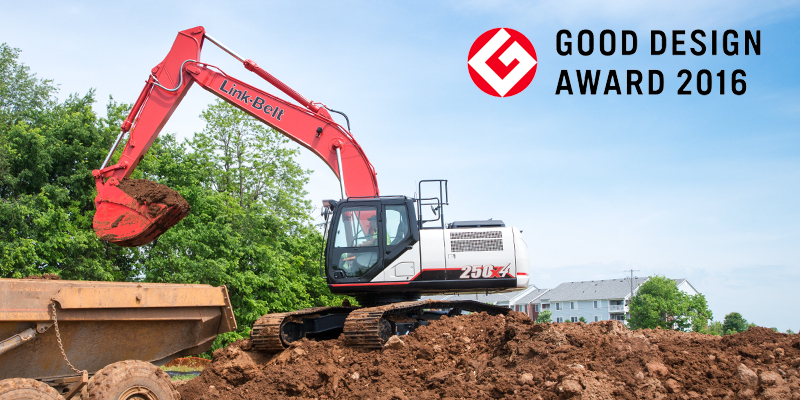 For 2016, Sumitomo/Link-Belt was the only construction equipment brand that received a Good Design Award. The primary reasons given for receiving the Good Design Award were realizing further improvement in operability and comfortability features of the machine. Additional incorporation of information technology was cited as a major reason for high marks in the “operability” category. On the “comfortability” side of the equation, components that operators touch directly, like the seat, arm rest and joy stick were lauded as examples of high-quality, ergonomic designs that contribute to operator comfort under long hours of operation. The open and clean appearance of the cab window also received high marks. The Good Design Award has been the premier design evaluation and commendation system in Japan since 1957. Many companies and designers from both inside and outside of Japan participate in this opportunity to enhance the industry or the quality of life through exceptional product design. The “G Mark” symbol has become a widely recognized mark representing good design. Thousands of designs are reviewed each year, among which the highest scoring 100 are named to the Good Design “Best 100.” This year proved to be the busiest in recent memory, with 4,085 Good Design Award entries screened.